Former Tottenham boss George Graham says Fabio Capello is not the right man for Spurs, arguing the 67-year-old Italian is not as good as he once was. Ex-England coach Capello, in charge of World Cup finalists Russia, is one of several managers tipped to replace the sacked Andre-Villas-Boas. But Graham told BBC Radio 5live that Capello is "probably past his best". He added: "He's a very opinionated, a very strong manager and I don't think that would fit with Tottenham." 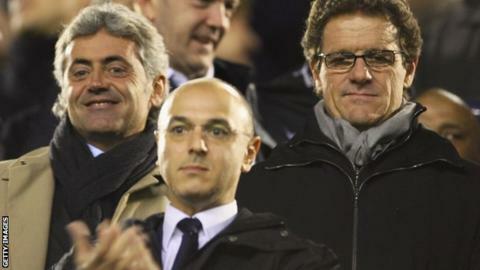 Capello was at White Hart Lane on Sunday to watch Spurs suffer a 5-0 defeat by Liverpool. The following morning, Villas-Boas was sacked after less than 18 months in charge of the Premier League club. Capello's appearance at White Hart Lane and his association with Spurs technical director Franco Baldini, who was his assistant with England, has added to speculation about him taking over at Spurs. "Capello's quite friendly with Baldini who has a big influence at Tottenham," added Graham, 69, who managed both Tottenham and north London rivals Arsenal. "He could take it on a short-term basis until the end of the season and then take Russia to the World Cup, so that's a possibility." Glenn Hoddle, who has played for and managed Tottenham, is keen on a return to White Hart Lane - either for a short spell or longer term. But Graham is not sure the former Spurs midfielder, another ex-England boss, will get a second stint in charge after managing the club between 2001 and 2003. "He has been there before and they've actually sacked him, so it's an interesting one," said Graham. "It would be a big decision to actually hire him again." Ossie Ardiles disagrees with Graham and believes, like Gary Lineker, that his former Spurs team-mate, 56, is the perfect choice. "For me, the man for the job is Glenn Hoddle," Ardiles told TalkSPORT. "I think he is a wonderful manager and he is a lot more mature, so I think he will be a wonderful choice. As Tottenham owner Daniel Levy works out what to do next, former Spurs chairman Lord Alan Sugar believes the club's clutch of summer signings - following the world record £85.3m sale of Gareth Bale to Real Madrid - are a key reason why they have struggled. Tottenham recruited Paulinho, Roberto Soldado, Nacer Chadli, Etienne Capoue, Christian Eriksen, Vlad Chiriches and Erik Lamela, but all seven have been unconvincing so far. "The money was spent irresponsibly, in the sense that you can't just go and buy, quickly, seven players and shove them into a team," said Sugar. "Was the team that bad that he (Villas-Boas) needed seven players immediately?" Sugar feels Arsenal boss Arsene Wenger adopted the correct approach by signing just one world-class player in the summer, spending almost £40m to bring midfielder Mezut Ozil from Real Madrid. "If you take Wenger, for example, he has taken a lot of pressure at the early part of the season, but he has spent on somebody that he wanted to spend on, not just spending for the sake of spending," said Sugar. Sugar was very critical of Villas-Boas while he was in charge of Spurs but insisted he did not feel vindicated following the Portuguese's sacking. "There is no vindication here," said Sugar. "I'd like to clear that up."